Surely you are not suggesting that a mother that does not also work a "job" is incapable of understanding what it must be like to be a mother with a job. Like she lives in a box. Like she doesn't know anyone in that situation. Like maybe her own mother didn't work and raise a family, too. The only women who can possible know about that situation are those who live it? 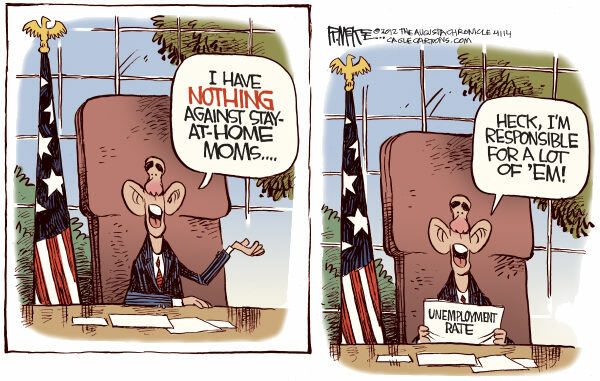 If being wealthy and raising a family without also working disqualifies you from being able to empathize with, or understand the tribulations of working mothers, that means that Barack Obama can’t possible know anything about how to fix the economy, or encourage businesses to hire more people, or understand the environment. Therefore, we should have elected someone who knows about business and economics. Like Mitt Romney, or Herman Cain. Empathy and understanding are not different; you cannot empathize without first understanding. You realize, I hope, that people like you and me would not have a job without business owners/the wealthy. It’s hard to tell how the left has distorted Romney's business experience, but his company, Bain Capital, was a venture capital company, which buys businesses in the hopes of operating them at a profit. Some of those businesses were in trouble when they were bought, and some of them ultimately failed. Others failed after his company had bought and operated them and later sold them. Some you may recognize are: Staples, Domino's Pizza and Sports Authority. He also saved the 2002 Winter Olympics, which was suffering financially and from allegations of bribery involving previous executives. People who actually have run something, made a payroll and understand about income and expenses are a rare thing in government. In that capacity Romney is obviously and definitely part of the solution.